I have said a few times in my blog, that they do things different in Alaska. Not only is just about everything bigger (and better) up here in the Great White North but there are also some things that are quite peculiar too. 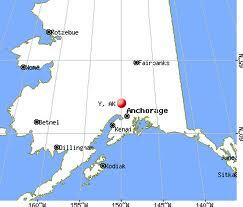 Take the town, village, hamlet or what ever you want to call it, named Y, Alaska. That’s right “Y”. No other letters in this little town’s name. Just the 25th letter of the alphabet. Y, Alaska is a just a short drive, 4.3 miles to be exact from Willow, the town which I live and the (arguably) mushing capital of the world. The Iditarod starts here for goodness sake. Located in between Willow and the eclectic little town of Talkeetna is Y. If you are heading to Denali National Park–Yes, that park with that mountain–you will pass right by Y if you blink or are swatting mosquitos from your brow in the summer. Who could not like a town with the name of Y? Well, at least a 1000 people do. With a median income of about 38 grand you probably won’t get rich if you move here and I think most of the gold mines are already claimed, but you will be in good company. Just about everybody has a job (8.3% unemployment) and over half are married with the median age of just over 40. And it’s ranked eighth on the list of top 101 cities as the snowiest. I guess that rules out a lot of opportunities for all you Generation Y’ers or whatever you are calling yourself these days. If you move here you will have to hang out with all of us ‘old fogies’ but there is a pretty good chance your iPhone will work in Y. Mine does. So as you are passing through make sure you check in on foursquare! If you are looking for a social scene Talkeetna has a few good bars and some of the best pizza I have every had at Mountain High Pizza Pie. In Willow you will find the Willow Trading Post and occasionally a live show from Alaska legend Hobo Jim. He rocked the house last March the night before the Iditarod re-start. What a great guy! Sure, Anchorage–about two hours away–has all the shopping, shows, restaurants and nightlife. They even have the opera and the symphony if you are so inclined. But if you want the real deal in terms of rubbing elbows with the rich and famous the closest city (Los Angeles) with a million people or more is just a mere 2375 miles away. I know, I know, you probably won’t be renting a U-haul to move to Y, in the near future but I bet if your are on one of those packed tour buses heading to the park this summer to catch a glimpse of a few sheep you will sitting elbow to elbow next to a guy that bought his whole wardrobe at Cabela’s. You should have rented a car at the airport. At least then you could stop in Y. Why not? Previous Trails, trails and more trails!